How do you learn about agriculture and your community? With “two faces” in Clermont County – urban and rural – it is important to address how agriculture and the community work together to provide the necessary resources for everyday life. A diverse audience attends the Clermont County fair: rural, urban and suburban. This is due, in part, to the location of Clermont County in southwest Ohio (it is situated adjacent to the urban city of Cincinnati) and it being a county with rich roots in agricultural history. As the need was identified to inform the diverse audience, the Clermont County Extension Agriculture and Natural Resources Educator and Community Development Program Coordinator collaborated to educate the public on agriculture and community development. The specific audience targeted involved the public and exhibitors who attended the Clermont County Fair in 2016 and 2017. 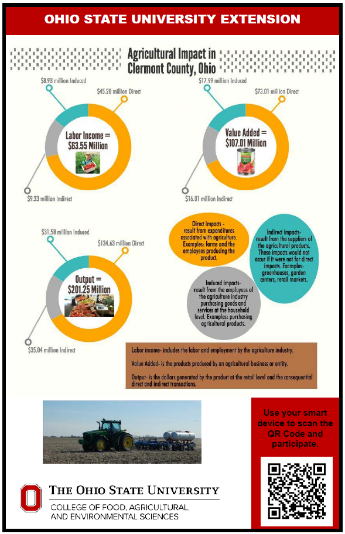 To educate this audience, posters (Ag in the Community) were created with facts from United States Department of Agriculture statistics, county statistics and various commodity organizations. Each poster has a QR code or barcode, which may be scanned with a smart device, linked to an online blog page for data collection. Posters were color printed on 11”x 17” paper and laminated before being displayed around the fairgrounds at designated locations. There were approximately 65,000 people who attended the 2016 Clermont County Fair who could have viewed the educational materials. 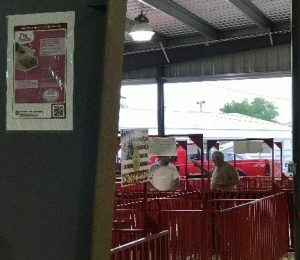 We know that 376 fair-goers viewed the posters via the QR code. Results from the 2017 Ag in the Community posters are pending. Our Ag in the Community posters have enabled us to better educate the public on types of agriculture and community development issues and opportunities in Clermont County and gather contact data for our newsletter and blog page as well as to determine if a participant knows about Extension or has ever used Extension services. Results indicate that audiences in Clermont County were interested in learning more about agriculture and the community. Most have attended educational programs and want to learn more about the work we do. 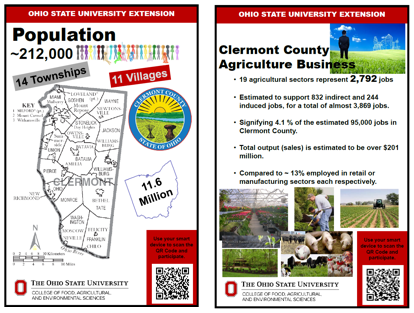 This effort has aided in bringing the OSU Extension Clermont County blog site to nearly 1200 subscribers. Through the Agriculture in the Community poster program, we were able to collaborate in educating the public on agriculture and their community. Reach out to other Extension program staff in your office today to collaborate in this one simple way. Trevor Corboy is a Program Coordinator in Clermont County & Miami Valley EERA.